We can plan for many things in life. Unfortunately, an auto accident is not one of them. No matter how many precautions we take or how well a vehicle performs on safety testing, there is no accounting for a driver’s negligent actions. Their carelessness could result in tragic injuries and unfortunate losses that can place a heavy burden on the accident survivors. 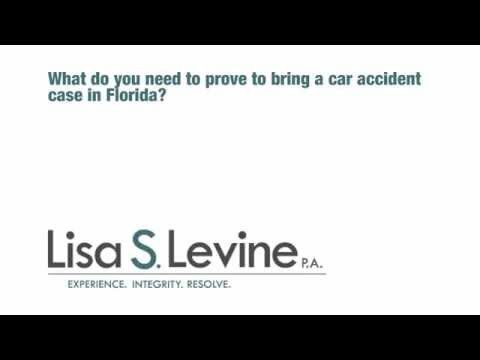 At Lisa S. Levine P.A., our Fort Lauderdale car accident lawyer will always put your needs first. Since Broward County’s approximately 1,748,000 residents rely heavily on private and public transportation, there is always a risk of becoming involved in an auto accident. Car accidents can range from minor fender-benders to serious high-speed collisions. However, even a seemingly minor accident can result in injuries that require costly treatment and care. You should never have to suffer because of a driver’s negligent or even criminal actions. If your insurance company does pay out a claim, it may not be enough to provide reasonable payment for medical bills, lost wages, and even loss of employment due to the accident. Fortunately, you do have rights in this situation, which an experienced personal injury attorney can help you determine. 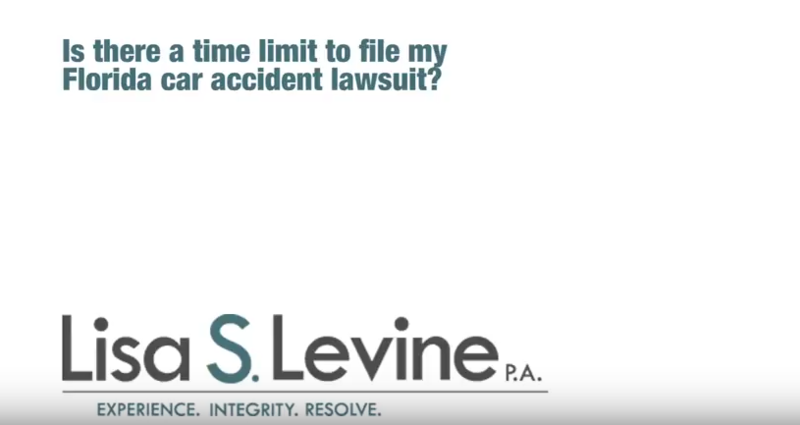 At Lisa S. Levine P.A., our personal injury attorneys will always put your needs first. We work every day with adults and children who have had their whole worlds changed in a South Florida motor vehicle accident. Contrary to how these situations have sometimes been portrayed, these people are only interested in receiving reasonable compensation to address the losses sustained. Our attorneys understand the tactics often used by insurance companies in Fort Lauderdale to deny claims or provide minimal compensation. In fact, our clients benefit from the knowledge of a former insurance defense attorney who has worked on the other side of the aisle in auto accident cases. Anticipating arguments and tactics used by an insurance company can be invaluable in pursuing your claim. If you feel your accident was caused by a driver’s negligence, it is in your best interests to understand all of the options available to you before making any decision. 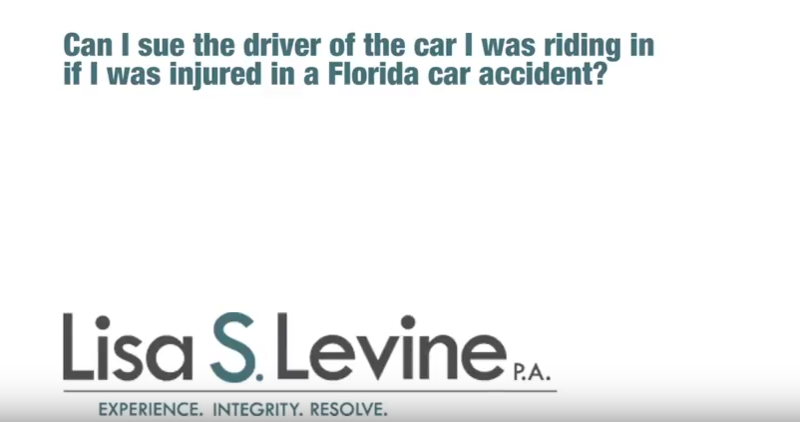 We work with Florida auto accident survivors throughout Fort Lauderdale, Weston, Hollywood, Pompano Beach, Miramar, Pembroke Pines, and surrounding Broward County, Miami-Dade County, and Palm Beach County communities. Call 954-256-1820 or send an online message to learn more about your options. The consultation is free and can provide you with critical information in your time of need. If you are unable to visit our convenient Weston and Fort Lauderdale locations, we can visit you at your home or in the hospital. We also want to reduce your burden and will not charge any attorney fees for your case, unless we achieve a recovery for your losses. That is our promise to you. It’s uncommon to watch the daily news without seeing a story about a serious auto accident. These tragic events have almost become a reliable occurrence on the local news. However, the news reporters often do not go into detail about what comes next. How does the survivor of an car or truck accident in Fort Lauderdale begin to cope with the fallout from their injuries? We work exclusively with personal injury cases in Florida. We understand that there are a variety of scenarios that can lead to an auto accident. Because of this, we firmly believe that there is no such thing as a one-size-fits all approach for collision cases. Even though two cases may seem similar, it is the tiniest details that can make all the difference in building a successful strategy. Injuries stemming from car accidents, truck accidents, motorcycle accidents, and even boating accidents can vary widely in nature. Neck and back injuries are among the most common due to the mechanics of a collision and the fragile nature of the human body. An accident, however, can just as easily cause paraplegia, fractures, herniated discs, and even brain injury. Everything from the speed and angle of the collision to the road conditions can turn an otherwise minor accident into a serious injury collision. There are also many different causes of auto crashes. Inattentive driving and reckless driving are among the most common. A Fort Lauderdale car accident lawyer can provide invaluable assistance in helping you hold these careless drivers accountable, whether the accident involved an uninsured Florida motorists or a drunk driver. Our attorneys will always be here for you, every step of the way. Insurance companies prioritize profits and satisfying shareholders, which can present a conflict when you want to receive compensation for your injuries. Rather than immediately agree to an offer the insurance company presents, you should consult with an experienced auto accident lawyer in Fort Lauderdale. 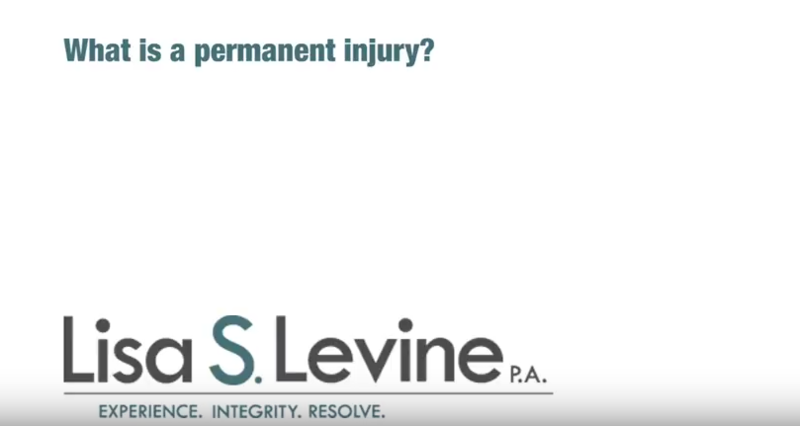 At Lisa S. Levine P.A., we will never force you to make a decision that does not have your best interests in mind. Unlike some other law firms who prefer a quick resolution and settlement, we understand that there are other options that may be more beneficial. Settlement should never be decided upon without weighing the benefits of other paths and their impact on your life. Because our Weston auto accident law firm goes the extra mile in proactively building your case, we often have more flexibility in finding beneficial resolutions. From the moment you first call our office, we begin setting the foundation for your case. When we prepare with a well-documented, researched, and argued case from the very beginning, we often provide you with more options in pursuing a favorable settlement or verdict. Seek out evidence including witness statements, photographs, and expert opinions. Obtain and analyze police and operator reports. Evaluate and value your injuries. Seek reimbursement for your medical costs. Negotiate your claim to achieve the most favorable ruling. Cell phone with a camera. Medical information card – detailing insurance numbers, allergies and conditions that may require special attention if you are not conscious. Contact names and numbers: emergency numbers and relatives contacts. Small road cones, emergency flares. Receiving compensation is not automatic or guaranteed. Choosing the best Fort Lauderdale car accident lawyer can help to ensure that you are compensated reasonably for your losses. Head injuries (concussions, blunt force trauma). If you are unable to reach a settlement with the defendant or the insurance company in question, your attorney will file a negligence lawsuit to recover the damages to which you are entitled. In order to win a lawsuit under a negligence theory, your attorney will have to prove the four elements listed below by a preponderance of the evidence. A preponderance of the evidence is your burden of proof at trial. Duty: The driver must have a duty to operate their vehicle with reasonable care. This duty is owed by all drivers on the road in Florida, and is a higher duty for individuals who operate commercial vehicles. Breach: The driver must have breached this duty they owed to you. A breach is some act or omission, such as texting while driving or failing to abide by traffic or road signs. Causation: The injuries you suffered from the accident must have been actually and proximately caused by the driver’s negligence. Damages: You must have suffered some form of compensable injury due to driver negligence. Broward County Civil Court – This link sends you to the Broward County Clerk of the Courts home page. Here you can look up case results, addresses and phone numbers, along with court services, forms, online services and frequently asked questions. Florida Department of Transportation – Clicking here sends you to the home page of the Florida DOT. The site contains information on the department itself, the safety office, various statistics, travel information and FDOT facilities. National Highway Traffic Safety Administration – This is the home page of the NHTSA. The site has links and resources concerning driving safety, vehicle safety, research, data and laws & regulations. As a dedicated Broward County auto accident law firm, we work with clients throughout many diverse and growing communities. We are proud of the accomplishments and initiatives made by members of the community to increase the safety for all drivers, pedestrians, and bicyclists on the road. This effort has reflected in statistics released by the Florida Department of Safety and Motor Vehicles. Each one of our clients has had their own unique life story, goals, and burdens that they have shared with us. They come from every corner of South Florida and within Broward County. This includes Coral Springs, Plantation, Sunrise, Lauderhill, Tamarac, and all nearby areas. No matter the background of our clients or the severity of their situations, they can rest assured they will receive the full attention, honesty, and compassion from a compassionate Fort Lauderdale car accident lawyer. We consider it our honor and privilege to defend your from the worst abuses of insurance companies. 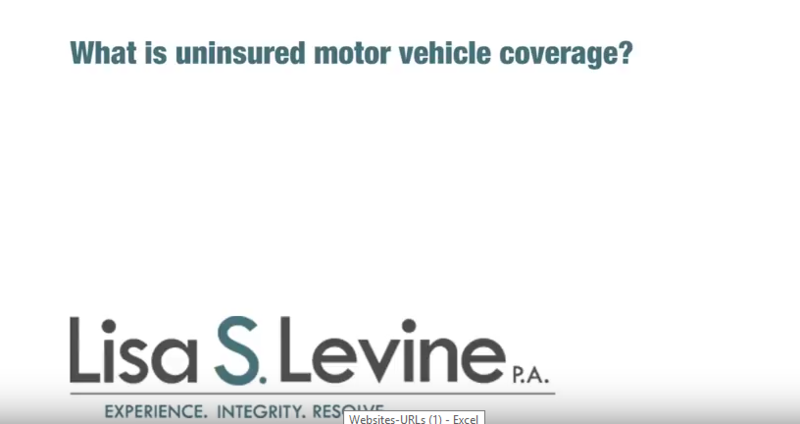 Whether you sustained back injuries from an auto accident in Weston, or have had your mobility restricted from an uninsured motorist accident in Pembroke Pines, we are ready to help. 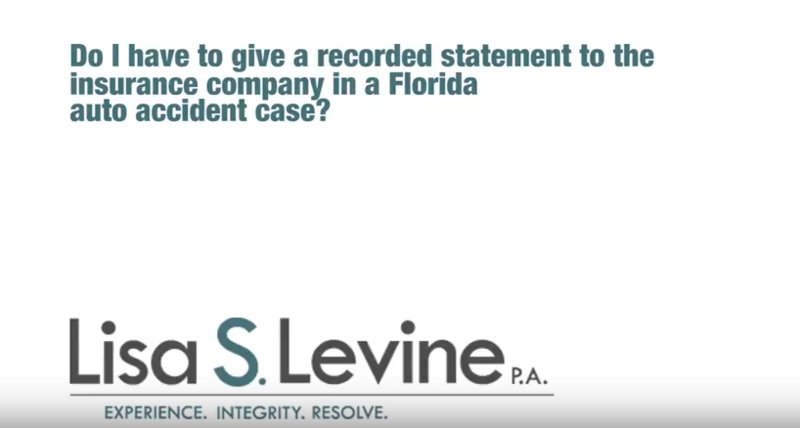 Call 954-256-1820 or take advantage of our convenient online contact forms to begin fighting for the compensation you need to cope with your losses.